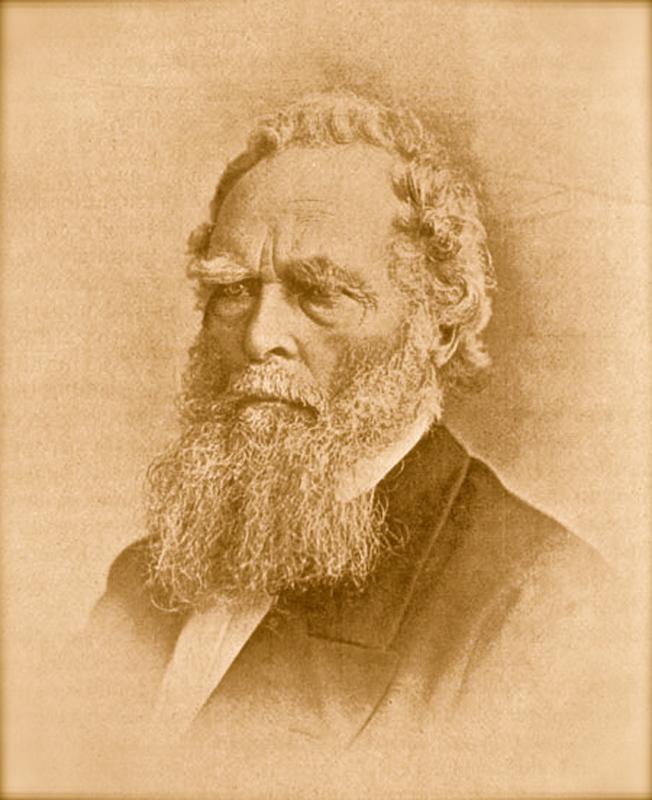 William Bross in later life. 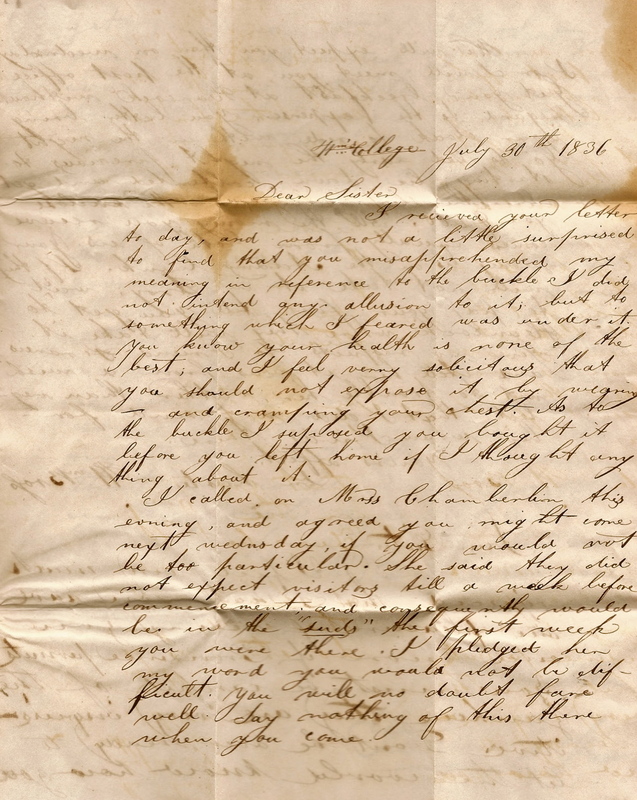 This letter was written in 1836 by Williams College students William Bross (1813-1888) and Stephen Decatur Bross (1813-1889) to their sister, Margaret Bross (1819-1856), who attended the Troy Female Seminary. They were the oldest of at least 11 children born to Moses Bross (1792-1882) and Jane Winfield (1795-1868) of New Milford, Susquehanna, Pennsylvania. Though William and Stephen were twins and roomed together while attending Williams College, William appears in the Junior Class and Stephen appears in the Sophomore Class in the 1836-7 College Catalogue. The biography of Stephen Decatur Bross is not so tidy as his brother’s. It appears that Stephen was married once or twice in the East before coming to Burt County, Nebraska in 1856 to start up the town of Decatur. It also seems that Stephen stopped using his surname Bross and went by the name of Stephen Decatur. By 1870, he is reported to have moved to Colorado where he lived the remainder of his life. 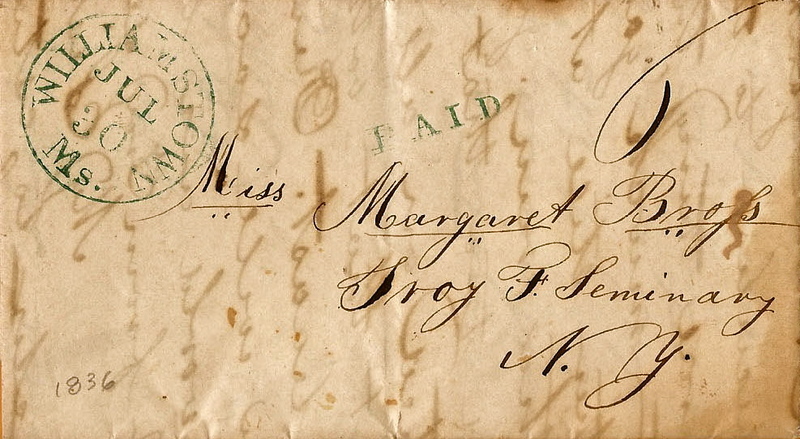 Margaret Bross was born near Port Jervis, Sussex Co., N. Y., in 1819, moved with her parents to Milford, Pa., where she attended the Academy until the age of fifteen years. She entered Troy Female Seminary in 1832, and graduated in 1836. Following her graduation she was employed for three years as governess in the family of Charles Edmonston, of Charleston, S. C., at a salary of $400 per annum. In 1839 she filled the position of Vice-Principal in Ridgebury Academy, Orange Co., N. Y., of which her brother, William Bross, was principal. She contributed occasionally to newspaper and magazine literature and was justly accredited with superior intellectual gifts. In 1843 she married Chauncey Thomas and was the mother of four sons, three of whom grew to manhood: William Russell Thomas and M. Bross Thomas graduated at Williams College; Chauncey Thomas, at Annapolis Naval Academy, and became a Real Admiral; William Russell Thomas is assistant editor of the ” Rocky Mountain News ” in Denver, Colorado: and the Rev. M. Bross Thomas is Professor in the University in Lake Forest, 111. Noble men of a noble mother, whose character was moulded by the far-reaching influence of Mrs. Emma Willard. I received your letter today, and was not a little surprised to find that you misapprehended my meaning in reference to the buckle. I did not intend any allusion to it, but to something which I feared was under it. You know your health is none of the best, and I feel very solicitous that you should not expose it by wearing — and cramping your chest. As to the buckle, I supposed you bought it before you left home, if I thought anything about it. I called on Miss Chamberlain this evening and agreed you might come next Wednesday, if you would not be too particular. She said they did not expect visitors till a week before commencement and consequently would be in the “suds” the first week you were there. I pledged her my word you would not be difficult. You will no doubt fare well. Say nothing of this there when you come. We will expect you then on Wednesday. I or Stephen will meet you at the post office. Get your breakfast at Hancock without regard to the expense. You better bring your cloak to ride with in the night. Go to bed early the night previous to starting; lie down contented and get all the sleep you can. We enclose you $2.00. All the money you receive comes equally from both of us. Your money is on the Adams Bank. If they will not take it in Troy, wait to pay your fare till you get to Hancock where they will take it. Give my respects to friend Francis and tell her it was from & wish not to trouble her, rather than neglect that I did not send for her when I was there. My sister, we have a character to establish in the world. Shall we not do it? This is pretty cool. I am a descendent of William Bross and have been researching him for years. 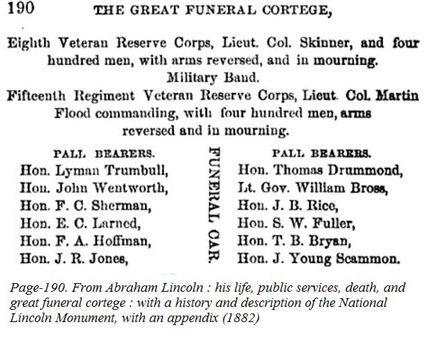 I have had difficulty finding documentary evidence of his being a pallbearer for Lincoln so this is great. I am sure that William Bross and Stephen Decatur Bross were not twins. My records indicate that: William “Deacon” Bross was born on November 4, 1813 in Montague, Sussex County, New Jersey and Stephen Decatur Bross was born on November 27, 1815 in New Jersey. 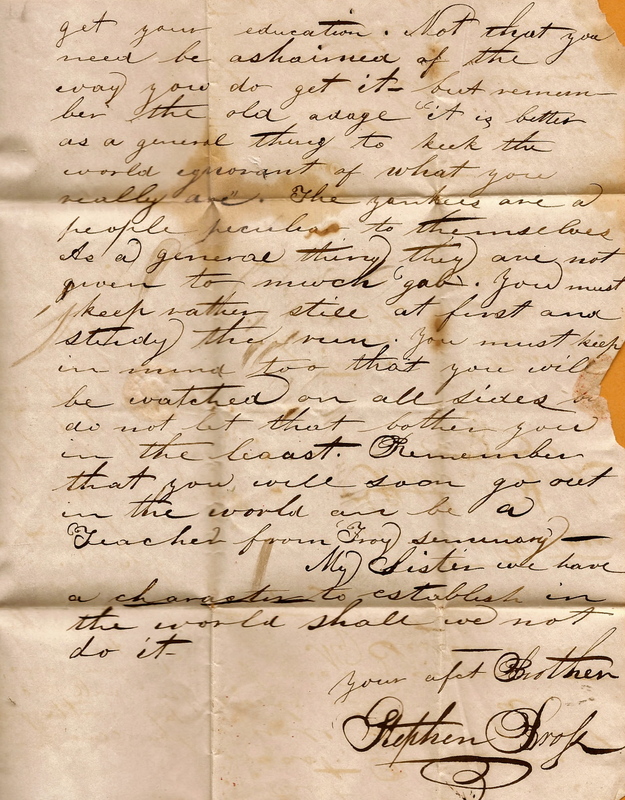 It is really interesting to read the letters these two historic brothers wrote to their sister. This family was very accomplished as these letters confirm. Larry Murphy Decatur Museum Board, Decatur, Nebraska. Yes this Decatur Nebraska was named for Stephen Decatur Bross who was one of the town founders along with Peter Sarpy who established the second oldest settlement in Nebraska. Hello – I am John A. Bross, great grandson of William’s brother John A. Bross. I found in the Chicago Historical Society a handwritten family history by William indicating that he was born Nov. 4, 1813 and Stephen Decatur was born Nov. 27, 1815, and Margaret April 22, 1819. There were 12 children in all including a daughter who died soon after birth. 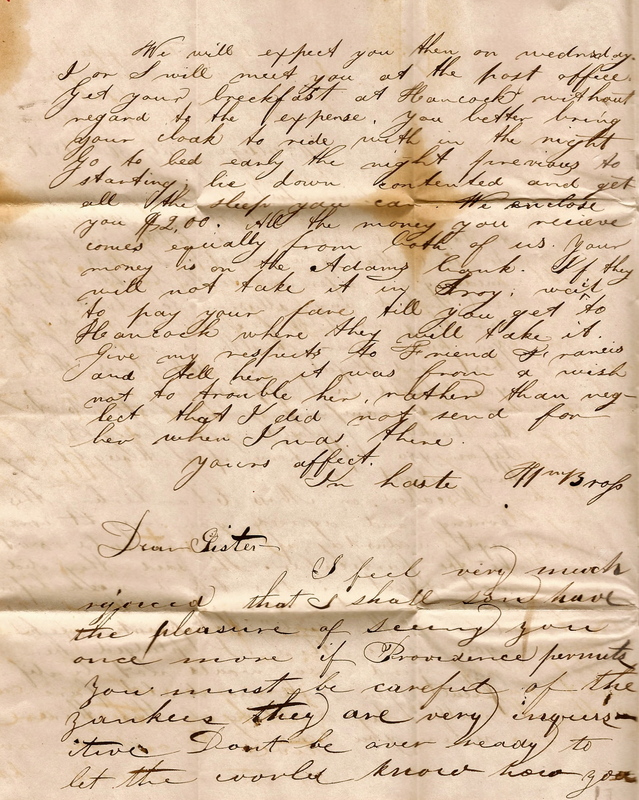 They also have a letter from John to Margaret explaining what really happened between him and an unnamed young lady from Michigan with “lustrous blue eyes” to whom he did not get engaged. Greetings John A., you are my 3C2R. I know your grandfather was Mason Bross, but that is all I know. I would be interested in knowing more. I know quita a bit about Col. John A., his siblings and ancestors. You can find me on facebook, I am a farmer.